Joshua and family celebrating the ministry of Man Wisdoms. Meet Joshua Zarzana. The young pastor from the Northwest has recently moved to the Southeast, accepting the lead pastor role at Spirit Lake Community Church of God in Winter Haven, Florida. But just because his ministry setting and title have changed doesn’t mean one of his greatest passions has dried up. In fact, Joshua’s heart for men’s ministry remains strong and seems only to be growing. And it shows, as his ongoing platform to reach men can now be accessed anywhere WiFi or data is available! Through regular video posts, Joshua’s “Man Wisdoms” outreach offers nuggets of wisdom tailored especially to the particular needs of men at home, work, church, society and more. With Father’s Day in view, the need for godly husbands and dads is perhaps arguably greater than ever, and Joshua Zarzana has chosen not to sit on the sidelines. He’s cheering his fellow man on to the goal set before them through Jesus Christ. But you should know, Joshua Zarzana wasn’t always the man he knew he should be. And while his humility today would lead him to say he’s nowhere close to deserving of the Father- or Husband-of-the-Year Award (no doubt his family would argue otherwise! ), he’s certainly come a long way. His 2014 book The Son Who Chases the Father chronicles the journey of trials met and lessons learned, describing in dramatic detail the impact his father had on him as a child. Joshua’s father wasn’t known for making very many good choices himself, and the family knew this fact firsthand, often bearing the consequences of poor decisions. But through his mother’s prayers and God’s grace, ultimately a transformational turnaround occurred in Joshua’s father, and young Joshua couldn’t help but witness what happens when God gets a hold of a man’s heart. Joshua and Joanne Zarzana celebrate the life God has given them today. 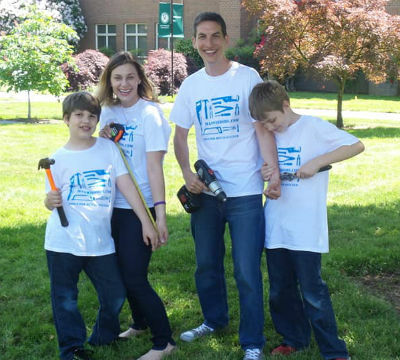 As the former Olympia-Lacey (Washington) Church of God family pastor, Joshua, along with his wife Joanne of fifteen years, thoroughly enjoys raising their two boys Christian, age eleven, and Alex, age nine. They reflect in awe upon the generational impact Joshua’s father has had, simply because he surrendered his life, work, ambition, and family to the Lord. And you have the chance to see Joshua’s sons who have been known to join Joshua on his teaching videos. To date, Joshua has filmed dozens of two-to four-minute teaching videos, each offering a nugget or two of wisdom straight from the Bible. He says that, while the process of writing his book did provide a foundation for men’s ministry, there were other key moments in the process. One of those moments came while he was watching the movie Courageous. In the film, the main character, Adam Mitchell, had a revelatory moment as he studies the Scriptures. He points out that he had previously no idea that God’s Word has so much to say about men and to men. While other men’s ministry resources offer step-by-step guides to raising kids and walking with one’s spouse, Joshua was determined to provide the often overlooked tools for men that come directly from the Bible, chapter by chapter. Joshua teaching on one of his videos. 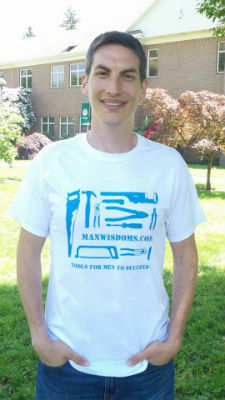 All the videos Joshua has produced can be accessed through the website, www.manwisdoms.com. He also shares his videos on YouTube and Facebook. Support opportunities, including the opportunity to purchase his book, are also available on his website. 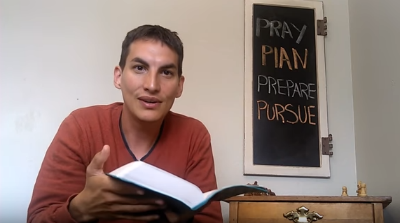 In the near future, Joshua plans to add a component of the ministry called “Your Wisdoms,” which will give followers the chance to share their own videos. Joshua hopes to solicit “wisdoms” from the perspective of spouses, mothers, children—any and all who can offer tools of godly wisdom to a world that needs fixing—from the Manufacturer himself. This entry was posted in All Church of God, Southeast and tagged books, creativity, dad, father, Father's Day, FL, Florida, husbands, innovation, Man Wisdoms, men's ministry, Spirit Lake Community Church, video, Winter Haven. Bookmark the permalink.